For crust: In a medium bowl, stir together flour, salt, and sugar. Using a fork or pastry blender, cut butter into flour mixture until mixture resembles coarse crumbs. Add buttermilk, 1 tablespoon at a time, stirring until a dough forms. Turn dough out onto a lightly floured surface; shape into a disk. Cover tightly with plastic wrap; refrigerate until firm, at least 30 minutes. On a lightly floured surface, roll dough into a 12-inch circle. Transfer to a 9-inch pie plate, pressing into bottom and up sides. Fold edges under, and crimp as desired. Top with a piece of parchment paper, letting ends extend over edges of plate. Add pie weights. Bake 20 minutes. Carefully remove paper and weights. Bake until golden brown, approximately 8 minutes more. Let cool 20 minutes on a wire rack. 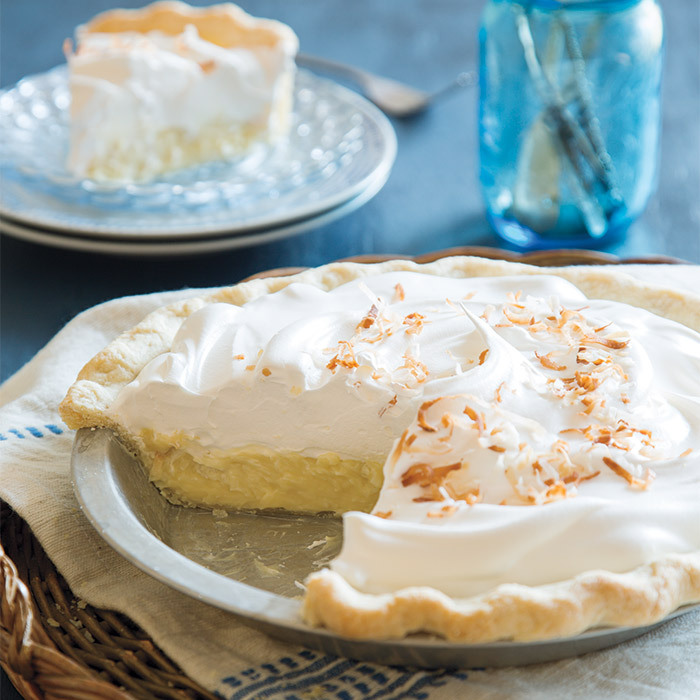 For filling: In a medium saucepan, combine sugar, cornstarch, and salt; whisk in milk, coconut milk, and egg yolks. Cook over medium heat, stirring constantly, until thickened, approximately 10 minutes. Remove from heat. Stir in coconut and vanilla. Spoon filling into prepared piecrust. Let cool 10 minutes. Place a piece of plastic wrap directly on surface of filling. Refrigerate until firm, approximately 3 hours. 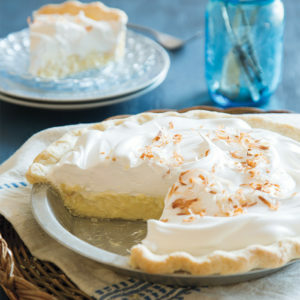 Top with Coconut Whipped Cream, and garnish with coconut, if desired. In a large bowl, beat cream and sugar at high speed with an electric mixer until soft peaks form. Add coconut milk. Beat until stiff peaks form, approximately 1 minute.